World Cup carbon emissions ‘offset’ by hydroelectric dams in the Amazon? 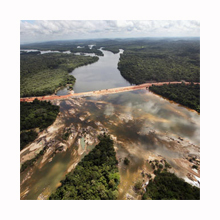 An article by Brazilian organizations FASE Amazonía, Grupo Carta de Belém and Fórum de la Amazonía Oriental, published by the newspaper “Aldeia”, challenges the myth – rooted in the carbon market – that the energy produced by hydroelectric plants is ‘clean’ energy, that is, an energy source that does not create polluting emissions. This claim ignores the many impacts caused by mega-dams in terms of deforestation, the displacement of populations, the building of roads in formerly inaccessible areas, the permanently flooded areas that produce greenhouse gas emissions, etc. Moreover, hydroelectric projects can be used to generate carbon credits through carbon market-based ‘offset’ mechanisms. This means that carbon credits generated by destructive projects like mega-dams have been used by the Brazilian government to claim that the also destructive FIFA World Cup was a “green” event.